Looking for escheat laws for each state?  Get started with our guide to state unclaimed property laws. Keanotes®, our industry leading compliance journal, eases the burden of tracking the various escheat laws by state by providing an in-depth view and analysis of unclaimed property regulations and state escheatment laws. Keanotes also includes editorial coverage of ongoing legislation changes, legislative summaries of escheat rules by state, guest columnists from state and industry professionals, Q&A sessions, continuous interpretation and recommendations to effectively comply with unclaimed property laws while increasing your company’s bottom line. Click on the button below to register for Keanotes®. You’ll receive a notification when new issues are published and real-time alerts for changes in escheat laws by state. For information on subscribing to Keane’s Unclaimed Property Compliance Portal, please visit www.keanecompliance.com. Stay informed and stay compliant with Keanotes! Interview with Sandy Willard, VP of Corporate Asset Recovery (CAR) and Paul MacCready, VP Liability Reduction & Remediation (LRR). Sandy and Paul provided insight and information on how CAR and LRR can maximize companies unclaimed property revenue potential. This article, by Ray Boone, focuses on Keane’s Reporting Team enhancements to its internal technology and platform to be nimble and flexible in making changes to state reporting requirements. Ann Fulmer, CPA, CFL shares information, best practices and various approaches on protecting acquiring companies from unclaimed property risks. Learn about Keane’s path to GDPR and privacy compliance through company-wide reviews, certifications and IT support. Also, take a look at what new laws and federal regulations are in process that may impact privacy compliance in the coming years. Unclaimed property is constantly evolving as states continue to propose and enact legislation, while also expanding compliance efforts via increased audits and guided self-audits. Heather Gabell, J.D. analyzes important litigations Univar, Inc. v. Geisenberger, et al., Minnesota v. Hall and S. David Goldberg v. Michael W. Frerichs and he impact these litigations have on unclaimed property. State legislatures are updating their unclaimed property laws in accordance with the 2016 Revised Uniform Unclaimed Property Act (RUUPA). In addition to RUUPA, state legislators also refer to the American Bar Association’s Model Act and the National Association of Unclaimed Property Administrators.